Between 1980 and 2000, local authorities in the UK were required by the Local Government, Planning and Land Act 1980, and later by the Local Government Acts of 1988 and 1992 to demonstrate competitiveness in procurement through a statutory Compulsory Competitive Tendering (CCT) procedure regulated by the Secretary of State. Although CCT was abolished in January 2000, its intensive application over a 20-year period has left a lasting legacy in the conduct of local public procurement in the UK. In addition, the interaction of CCT and European law--in particular, that relating to public procurement and the transfer of undertakings--continues to have significance for local authorities throughout the EU. This book is the outcome of research into the effects of CCT on two English local authorities. 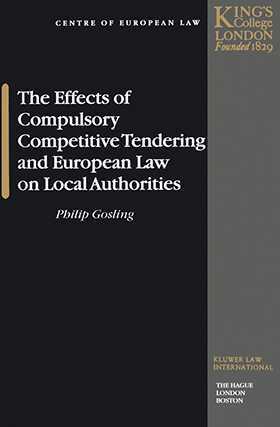 Its remarkably clear and detailed analysis examines the CCT legislation, the principal legal and practical issues that it raised both in the UK and for the EU, its effects on the two local authorities selected for study and the broader implications for local public procurement in general. The interaction of CCT and the European Acquired Rights Directive as implemented in the UK by the Transfer of Undertakings (Protection of Employment) Regulations (TUPE). The results of CCT are considered through case studies of the local authorities that examine the lasting effect on each authority's approach to service provision, organisational structure and general culture. In the last part of the book, the author summarizes his findings and offers conclusions that will be of value to public procurement authorities and their counsel everywhere.